Once the piece is completed, this man soaps, scrubs and cleans it. 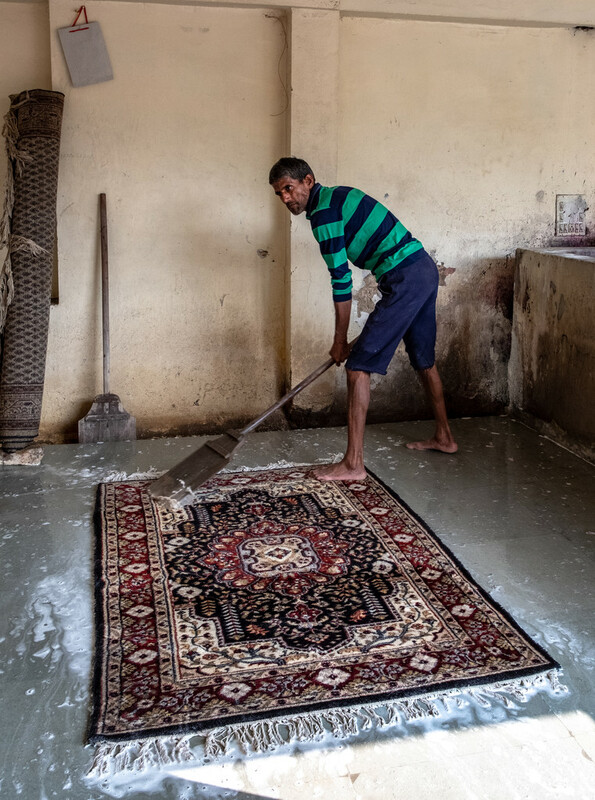 Nice to see a man cleaning carpets. @joysabin Isn't it! Blooming hard work done this way. @annied Makes me wilt just looking at them Annie. I can't imagine having to do this all day, every day. I wonder if I should do something about my rug. Wow lovely mat... pretty labour intensive ..
@yaorenliu Not like that, I hope. They must be pretty robust carpets to be washed like this, probably cost a fortune to buy and the workers paid a pittance! That intricate, marvellous carpet looks so out of place in those surroundings. It must be very heavy with water. I wonder how it dries. I love the colors of this one. Hard work but I think even this simple job can give someone a sense of worth when there's work to be done. Good shot. @dide They all were, but oh my gosh, far beyond my pocket. @gilbertwood Yes, you're right, he's struggling a bit, poor bloke. An absolutely rotten job, but I guess it puts food on the table back home. @onewing Oh yes, he was doing it hard. @merrelyn They are, they do, and, without doubt. @robz Interesting and apt observation Rob. @haskar He was getting most of the water out of it, but it would still need to be hung out or laid out on a rack somewhere to dry. @olivetreeann The carpets/rugs were all absolutely beautiful works of art.